Who'd have thought Birdsong and New British Comics artist Warwick Johnson-Cadwell would get a chance to appear in The Dandy? But he is - albeit as part, we think, of the revamped comic's experimental line up of strips that are subject to reader vote for their survival. 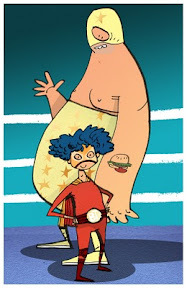 Tag Team Tastic is the latest addition to the weekly comic - a strip writer Robin Etherington describes as a ridiculous, comedy wrestle-fest starring two hapless fighters, Huggles and Big Thumper - which will soon be making its debut alongside another Etherington brothers story, YORE. "Warwick and I first met at a Bristol show a few years back," says Robin, "when he humbly showed me his portfolio. "Lorenzo and I see a lot of work by upcoming amateur and professional artists but this was something else. 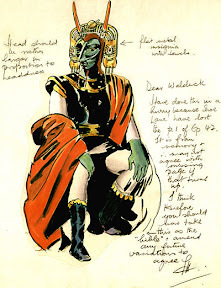 Warwick was already an extremely successful illustrator but the guy just loved comics with all his heart and wanted to make some more - which was lucky really, because so did I! "We now cannot wait to share the adventures of Huggles (the large fella) and Big Thumper (his blue-haired cohort) with you all," he adds. Robin also reveals that this isn't the final part of the Etherington's bid to be a major part of The Dandy - as a third strip by one - or both - of them - is also due to be revealed soon. The team at Fallen Heroes - the comics adaptation of the top-selling novel by Barry Nugent - have released a second teaser poster in advance of the project's launch at the Cardiff Comic Expo next month. The comic is being written by Martin Conaghan, whose work includes stories for Caliber Comics and works in sports broadcasting at the BBC, with art from Steve Penfold. This is the second of six teaser posters for the upcoming Issue 1 launch. "I’ve now seen 18 pages of art and I know I’m biased, but I love every single page of what I’ve seen," says Fallen Heroes author Barry. "It’s blown me away seeing my story translated to the comic form. "This was something I never expected to happen," he adds. "I can’t wait to hold the finished comic in my hands and hopefully that won’t be too long a wait. This is right up there with the first time I walked into Waterstones and saw my book staring back at me on the shelf. 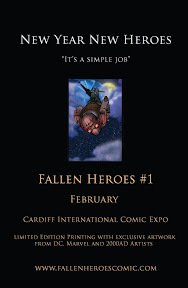 To celebrate its launch at Cardiff International Comic Expo Fallen Heroes - The Comic Adaptation #1 will be numbered and contain exclusive artwork from Andie Tong (DC Comics, Marvel, Darkhorse, Mirage Studios, Image and Markosia), Leigh Gallagher (DC Comics and 2000AD) and Emma Vieceli (SelfMadeHero, Marvel, Image, Random House, Toykopop and Future Publishing). This numbered limited edition will only be available at the Cardiff Comic Expo (any reprints of issue one will not contain this artwork). Once they’re gone they’re gone - so make sure you pick up your limited edition copy at the convention. The team tell us they also have an awesome motion trailer for the comic which will be launching soon - so keep an eye on the Fallen Heroes website for that. An original art work by the legendary street artist Banksy, created for a Greenpeace Save or Delete campaign photographic poster, sold for £78,000 last night at Bonhams, New Bond Street, as part of its Urban Art sale. 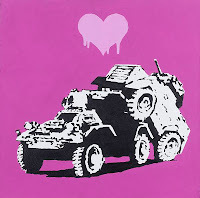 The unique piece, which was given to the vendor by the artist himself, was among a host of Banksy’s that fetched top prices in the sale. 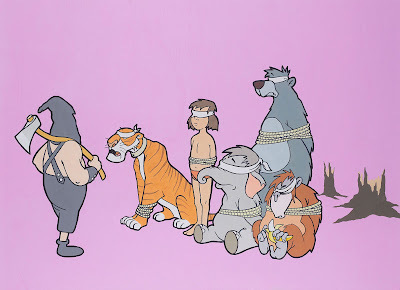 It was originally commissioned by Greenpeace to highlight the problems of global deforestation as part of their Save or Delete campaign and features some of the main characters from Disney’s The Jungle Book transposed onto a picture of a devastated forest. Intended for use on posters, billboards and postcards, it was printed, but never put into circulation because of the protectionist policies at Disney. It is believed that the vendor of this lot is donating a percentage of the proceeds to Greenpeace. Other Banksy highlights in the sale included Portrait of an Artist, circa 1998, believed to be the first work that he created for sale, which sold for £60,000; Everytime I Make Love To You I Think Of Someone Else, 2003 (left), which made £42,000; Balloon Girl, 2004, which fetched £12,600; and Rude Copper, 2002, which sold for £9,600. The sale saw an enormous turn-out and competitive bidding (both on the phone and in the room) following Bonhams’ two-year break from holding Urban Art auctions. Other works to achieve excellent prices included a performance piece created by American graffiti artist, Futura 2000, for punk rock band The Clash’s Combat Rock tour, which sold for £38,400 (it was estimated it might sell for between £15,000 – 20,000); French artist JR’s Street Kid, Favela Morro da Providencia, Rio de Janeiro, Brasil, 2008, which made £31,200 (estimate £15,000 – 20,000); and the catalogue’s cover lot, Shepard Fairey’s Peace Goddess on Wood, 2008, right, which fetched £27,600 (estimate £8,000 – 12,000). 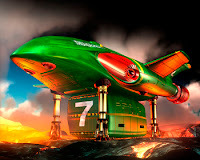 Thunderbirds are Go - Again! A re-imagining of the classic 1960s TV series Thunderbirds is in the works from the man who originally co-created the show - Gerry Anderson. 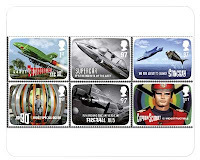 With the launch of a new set of Royal Mail stamps celebrating the work of Gerry Anderson, the 81-year-old producer has been conducting interviews about his work and told Radio 5 Live a new show was finally in the works. Fan club Fanderson confirmed Gerry had finalised a deal to make a new series, with Gerry revealing that he has signed a non-disclosure agreement for the time being. "I don't want to sound conceited," Gerry told Radio 5 Live, "but because I'm going to make it...I'm confident that it will be a smash hit!" The news has been picked up by media as diverse as the Daily Telegraph and Ain't It Cool News. 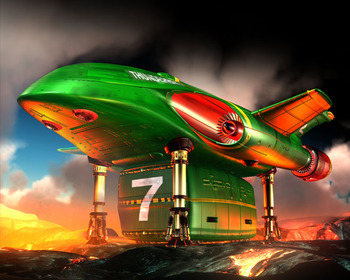 Gerry has long wanted to re-imagine Thunderbirds, but rights issues apparently prevented this for some time, so instead he re-worked another of his Supermarionation series, Captain Scarlet, into a gritty CGI show, first broadcast in 2005. It had a mixed reception, perhaps in part due to a decision to re-design all the original show's iconic vehicles such as the Spectrum Pursuit Vehicle and Angel Interceptors - but many praised its scripts and delivery. Thunderbirds was brought to the big screen as a live action movie in 2004, directed by Star Trek's Jonathan Frakes, but was panned by critics. In 2005, plans, as noted on our Gerry Anderson links page, were afoot to revive the show - again as a puppet show. Showrunner and director David Freedman (whose credits include the highly successful Legend of the Dragon and animated comedy series King Arthur's Disasters starring Rik Mayall and Matt Lucas) was one of the people involved. Brought in to create a new vision for modern puppet relaunch, Freedman says the goal was to bring the series up to date, but stay true to the magic of the original series. "Redesigned, reworked, re cast, re everything! The series was to have coincided with the release of the live action film, but Freedman says the merger between Granada and Carlton (in which Carlton was sort of swallowed whole) "put the kibosh on the whole thing". "It ws the best show never made," he enthuses on his current web site. We don't often cover US-based comics events, but this campaign goes beyond borders. The US-based Comic Creators Alliance has announced that their second annual fund-raising drive to raise funds to fight against human trafficking goes live today, 11th January 2011 - and donations will gain the donor a smashing piece of art featuring contributions from over 100 comic artists. Lora Innes, a comic creator herself, started the yearly drive to coincide with America's National Human Trafficking Awareness Day in 2010. Last year's drive raised a staggering $10,000 (£6420) and had over 87 artists working together on a special downloadable image just for the event. 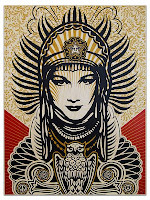 This year the drive has 110 of the best and brightest artists collaborating to create the 2011 image. Unlike last year, the image will be available in a print form as well as a digital download. One of the most unique points of this year's drive is the number of print artists who joined the strong web comic contingent from the previous year. All of the artists included in the drive are amazing and some of the fan favorites are: Scott Sava (The Dreamland Chronicles), Adam Hughes (Star Wars, Wonder Woman), Sarah Ellerton (Inverloch), Bryan Glass & Victor Santos (Mice Templar), Beau Smith (Wynonna Earp: The Yeti Wars), Billy Tucci (Shi), Mookie (Dominic Deegan), Crystal Yates (Earthsong),Thom Zahler (Love and Capes), and Alison Action (Bear Nuts). The complete list of participants is at http://comicalliance.weebly.com/the-people.html. 100 per cent of donations are being split between Love 146 (www.love146.org) and Grace Haven House (www.gracehavenhouse.org). Lora started the yearly drive after being particularly moved at a seminar on the issue. “There are currently 27 million enslaved people worldwide," she notes, "more than double the number of enslaved Africans during the trans-Atlantic slave trade. UNICEF estimates that 1.2 million children every year are sold into slavery, most of it sexual. The US Department of Justice estimates 16,000 victims of human trafficking are brought into the United States every year. (with thanks to John Paterson at TartanBaffles, Jeremy Briggs and Lew Stringer): It's been a matter of debate for British comics fans for many years, but DC Thomson staff think they may have confirmed the late, great comedian Bob Monkhouse wrote and drew for The Beano. It's well known Monkhouse, who had a massive comics collection and corresponded with many creators, including Commando artist Alan Burrows, worked for many British comics. He also revealed how he'd sent his single picture cartoons and comic strips to just about every comic publisher he could find the address of in his own autobiography, Crying With Laughter and was first published by Mickey Mouse Weekly, after a dozen tries, who printed one of the cartoon pictures when he was about 12. His comic writing career began in earnest during World War 2, working for companies such as Martin and Reid Ltd. who managed to get hold of stray loads of paper during wartime. 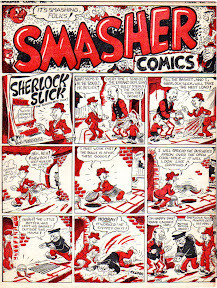 "Sometimes they found a consignment made from re-pulped bus tickets or newsprint," Monkhouse recalled, "so blackened by printer's ink that my drawings had to be painted in white on black background so as to be visible to the readers' perusal ... "
He drew strips for comics such as Smasher in 1947 (left, via ComicsUK) and Oh Boy, and illustrated one of his own books, Book of Days, published by Arrow Books in 1981. But although many people have suggested he also wrote for The Beano, including fellow comedian Barry Cryer, records from the time he may have contributed are spartan. Now, Beano archivist Bill McLoughlin thinks he has detected Bob's hand in a Pansy Potter strip for the 1947 Beano Book. "We have selected the 1947 Pansy, as it is in a style different from the rest," he told the Scottish Sunday Mail this week. "We can't say definitely but Bob always claimed he did draw for us and why would he tell pork pies about something so easily disproved?" "I'd heard he did draw for the Dandy and Beano – and that excellent BBC Four documentary on Bob last week repeated the rumour – but what he actually did was a mystery," comics expert and creator Lew Stringer told downthetubes. "Until now, it seems." 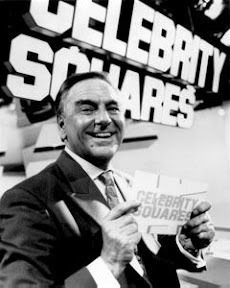 Monkhouse moved on from comics to become a script writer and as well as his comedy career is best known for hosting many game shows such as Celebrity Squares and The Golden Shot -- and, of course, Quick on the Draw. He died in 2003 aged 75. "Most of his comic work was for indie comics of the late 1940s and early 1950s," Lew Stringer notes. "He was an excellent cartoonist." "Comics loss was TV's gain." London's Imperial War Museum is organising a Comics & Conflicts Conference (curated by Panel Borders Alex Fitch) in August, aimed at comics scholars, practitioners, and enthusiasts. 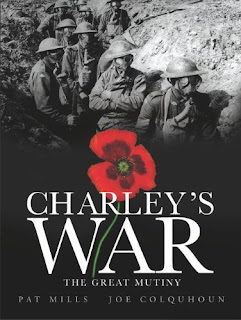 Taking place on 19th-20th August, conference speakers and guests will include Charley’s War creator Pat Mills, Martin Barker and Roger Sabin on Doonesbury; Garth Ennis (Troubled Souls, War Story); Jacques Tardi (It Was The War Of The Trenches) and Jean-Pierre Verney (Putain de Guerre). Paul Gravett will chair. Further details of this very special event (including details on the keynote speakers, special guests and registration) will be announced on the Comica News Blog. Depictions of conflict in comics created for children. Representations of trauma in comic books, graphic novels, manga and other forms of international comics. Visual representations of conflict in such places as Afghanistan, Britain, France, Germany, Japan, Korea, The Middle East, Northern Ireland, and Vietnam. Journalism, biography, and memoir in comics on conflict. Focus on key practitioners such as Guibert, Kubert, Mills, Sacco, Satrapi, Spiegelman, Tardi & Trudeau. Comics as a space to depict/critique national ideology. Comics as tools of propaganda, both of the state and of protest organisations. In the first instance please email abstracts of 250 words, with a brief author biography, to a.kahn@roehampton.ac.uk, including ‘Comics & Conflicts 2011’ in the subject heading. The deadline for submissions is 31st March, 2011. The Comics & Conflicts Conference is organised by Ariel Kahn, Senior Lecturer in Creative Writing at Roehampton University, Alex Fitch, presenter of Panel Borders, the UK’s only weekly broadcast radio show about comics, and Paul Gravett, Director of Comica. The Comics & Conflicts Conference will form part of a larger literary festival being held from 13-21 August 2011, which accompanies the Imperial War Museum’s new exhibition Once Upon A Wartime: Classic War Stories for Children. • For more information about the exhibition and the festival visit the Imperial War Museum web site. Hardback 240 black and white printed pages and 64 colour pages. The Book: Dan Dare, pilot of the future, was the creation of Frank Hampson, a young artist who cut his teeth on Meccano Magazine. Beginning in April 1950, Dan Dare was the lead strip in the hugely successful Eagle. The strip would only run to a couple of pages, but stories (and their weekly cliffhangers) could run for over a year. The majority of the strips involved Dan, a suave, natural leader, doing battle with all manner of alien lifeform to preserve the future wellbeing of Earth. Hampson's bold use of colour and figurative style (he used real-life models) were groundbreaking in post-war austerity Britain. Review by Steve Herbert: This is the story of the creation of Earth's greatest space hero, and the story of the two men who would together create the worlds gtratest childrens comic. Tartarsky tells the story of the Reverend Marcus Morris amd Frank Hampson's early beginings before Eagle, how Morris became a clergyman, created the Christian magazine The Anvil and formed the SCP (Society of Christian Publishing) and how he took the magazine all over Fleet Street with Frank's dumny comics to sell it single handedly, to save himself from bankruptcy. Intertwined with Morris's story, Tatarsky tells us how Hampson, the son of a policeman, discovered the world of comic books, learned his skils as an artist, discovered Space Travel in Antwerp during his Military service during wartime – and the eventual meeting of the two, which resulted in Morris offering Hampson work on The Anvil. Then how they went from a Christian magazine selling 9000 copies to a children's comic selling 900,000 copies of its first issue. The book follows the process of Eagle through the early studio system and its hardships and job losses, through to the end of Morris and Hampson's run through to Frank Bellemy's time and beyond. Although Tatarsky goes into details of many aspects of Dan Dare's creation, he dosen't set out to cover one area, but the general story he tells in style. The book is packed with a fair number of colour illustrations, and several in black and white. It's great value for money and made a excellent Christmas present - and for any Eagle fan, looks great on your shelf! 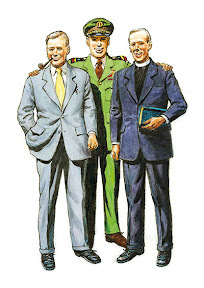 during the creation of the original Dan Dare stories for Eagle. 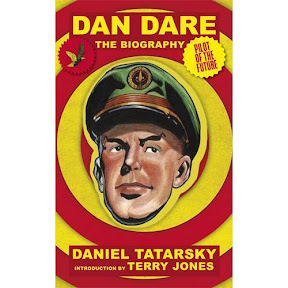 Review by Steve Winders: Daniel Tatarsky’s enthusiasm for ‘Dan Dare’ comes across clearly in this entertaining and informative book, which tells the remarkable story of how Southport vicar Marcus Morris and young artist Frank Hampson created Britain’s best selling comic and its famous space hero. Tatarsky provides a clear insight into the early life of Eagle from his interviews with Morris’ daughters, Hampson’s son and surviving members of the studio that Hampson set up to produce the Dan Dare strip. Colour pictures of studio sketches, roughs and photographs reveal the effort that Hampson and his team made to make the strip so convincing. As Tatarsky takes the story past the Hampson era his background information is not so detailed however and there are several mistakes. He wrongly attributes Hampson’s departure from Eagle to Odhams Press, who bought the publication in 1959. 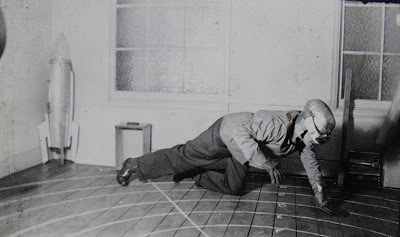 Although Odhams dismantled Hampson’s studio he did not leave until after the Mirror Group took over the publication. Tatarsky also makes several references to Keith Watson producing the artwork for the strip single handed from March 1962 until January 1967. While it is true that he did work on his own for much of this time, he was assisted by Eric Eden for a period, during which Eden produced some stunning airbrush work. Other comments in the book indicate that Tatarsky was unaware of this. Writing briefly about the relaunched Eagle which began in 1982 he says that it was given the “catchy name” of New Eagle and that it ran until 1992. In fact it was called Eagle and ran until 1994. There are other mistakes, too, but Tatarsky nevertheless analyses the original Eagle stories very well and explores the success and influence of Dan Dare with a real understanding. Errors apart, this is a well written book which definitely captures the spirit of a remarkable strip and its creation.